With an increasing global population and a decreasing supply of arable land, providing sufficient food to meet demand is becoming increasingly more difficult. 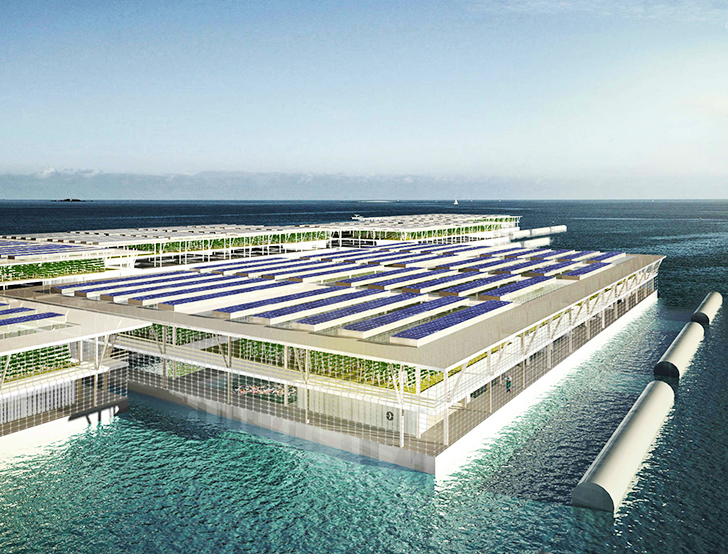 Barcelona-based design practice Forward Thinking Architecture proposes an innovative solution: Smart Floating Farms. 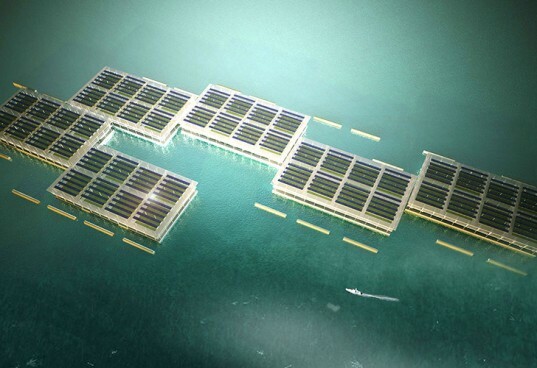 Designed to complement traditional farming, these solar-powered and modular floating farms make use of underutilized water bodies to promote long-term food security and resilience. The Smart Floating Farms (SFF) are designed as smart and fully automated systems that combine solar energy, hydroponics, and aquaculture. According to the architects, the commercially viable SFF project was envisioned with existing well-tested materials and technologies. The farms would be installed in nearby water bodies to reduce reliance on imported food and number of food miles traveled. The shape of the rectangular SFF modules was inspired by the traditional grid configuration used in floating fish farms in Asia. Each lightweight module measures 200 meters by 350 meters and can be connected with other modules to form clusters with built-in walkways. While the focus will be on farming, the project can also include modules that cater to farming research or education. The SFF module comprises three main levels: a ground level for aquaculture and desalination technologies; the first floor for hydroponic crop cultivation; and a rooftop level covered in solar panels, skylights, and rainwater collectors. By using stackable and modular systems, SFF are scalable, adaptable, and resource efficient. Each module is estimated to produce 8,152 tons of vegetables a year and 1,703 tons of fish a year. Politika, Vlada i svi dosadašnji sazivi Sabora krivi su što je na policama dućana i šoping centara uglavnom strani nekvalitetni proizvodi, na uvozu stranih poljoprivrednih proizvoda od 1991. do 2015. izgubljeno 30 milijardi dolara, a zbog uništavanja govedarstva i mljekarstva sto tisuća radnih mjesta. Evo kako to rade drugi koji Slavonije nemaju. The Smart Floating Farms (SFF) are designed as smart and fully automated systems that combine solar energy, hydroponics, and aquaculture. According to the architects, the commercially viable SFF project was envisioned with existing well-tested materials and technologies. The farms would be installed in nearby water bodies to reduce reliance on imported food and number of food miles traveled. Seems like more of a solution for countries with a high population to blow land mass ratio (i.e. Japan, Taiwan, etc.) than for other countries. Interesting concept, though. The Smart Floating Farms (SFF) are designed as smart and fully automated systems that combine solar energy, hydroponics, and aquaculture. According to the architects, the commercially viable SFF project was envisioned with existing well-tested materials and technologies. The design of the rectangular SFF modules was inspired by the traditional grid configuration used in floating fish farms in Asia. The farms would be installed in nearby water bodies to reduce reliance on imported food and number of food miles traveled. Each lightweight module measures 200 meters by 350 meters and can be connected with other modules to form clusters with built-in walkways.
. While the focus will be on farming, the project can also include modules that cater to farming research or education. The SFF module comprises three main levels: a ground level for aquaculture and desalination technologies; the first floor for hydroponic crop cultivation; and a rooftop level covered in solar panels, skylights, and rainwater collectors. By using stackable and modular systems, SFF is a scalable, adaptable, and resource efficient proposal. Aquaculture is on the ground level. The design promotes long-term food security and resilience. SFF increases local production, which means less dependence on imports and more self-sufficiency. 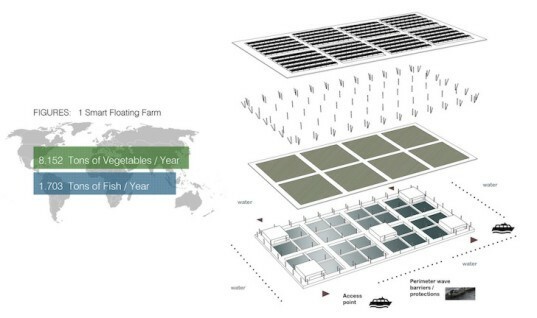 Smart Floating Farms by Forward Thinking Architecture.